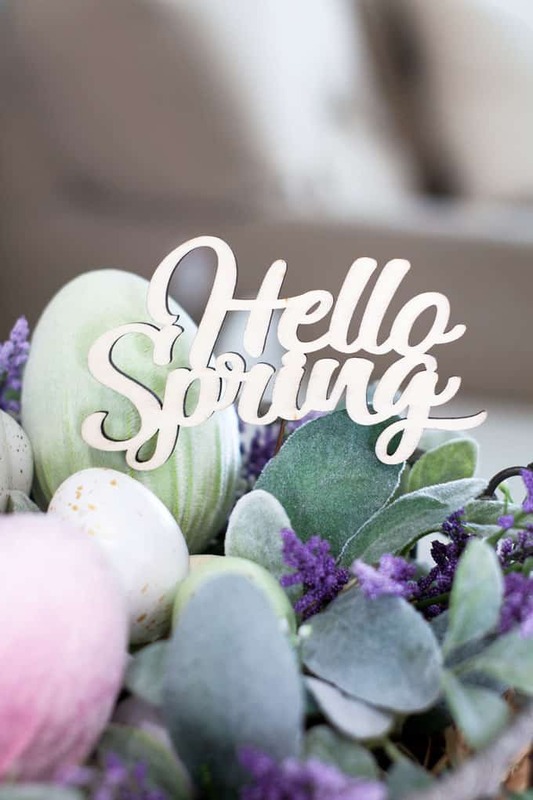 Spring is almost here (officially tomorrow)! 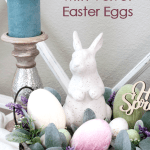 And to celebrate, I’m sharing my spring centerpiece with velvet Easter eggs. Yep, I said VELLLLVEEEET! Woot! If you are hopping over (see what I did there?) from LoraBloomquist.com, welcome! What a lovely site she has, right? And her centerpiece is so warm and looks like it was brought in right from the great outdoors! 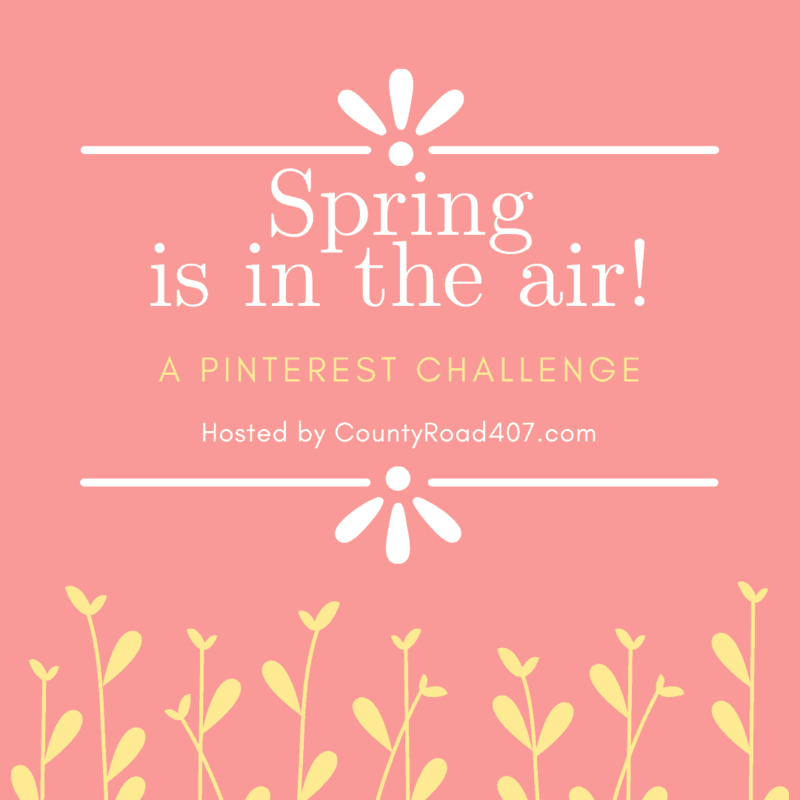 Our Pinterest challenge is hosted by Cindy at County Road 407. Thank you, Cindy, for being such a wonderful hostess and putting this together! Isn’t it amazing? Thanks, Lisa, for the inspiration! BTW, you can follow My Wee Abode on Instagram, too… @mywee_abode. Usually, I wait to share my finished product with you until the end. This time, you get to see the finished product first and then I’ll show you the steps to get the same look! Ta-da! 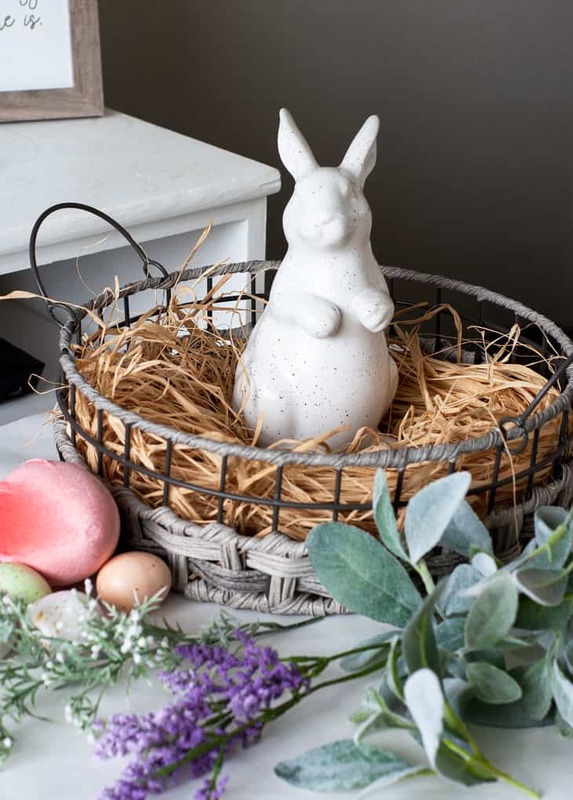 Let’s look at how to achieve this spring vignette that will add a bit of charm to your house, small home, or apartment. This is really a super simple vignette to put together. It really only took about 15 minutes. Cover the inside of the tray/basket with the raffia. This will allow you to insert the florals easily. 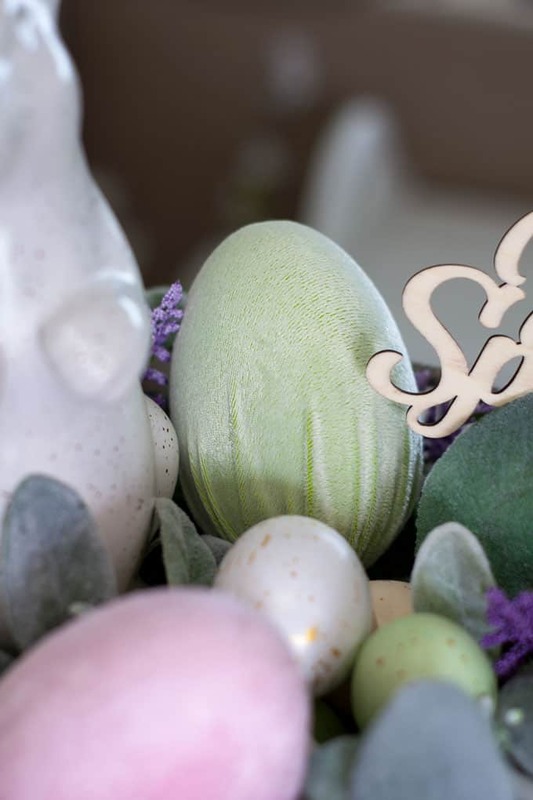 A small bowl turned upside-down adds height for the bunny to ‘stand’ above the florals and eggs. Add Lamb’s Ear, covering most of the top of the raffia. Arrange the florals so they stick out of the weave to add a ‘natural’ rustic look. 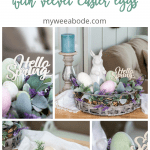 Add speckled Easter eggs, velvet Easter eggs and “Hello Spring” mini sign. 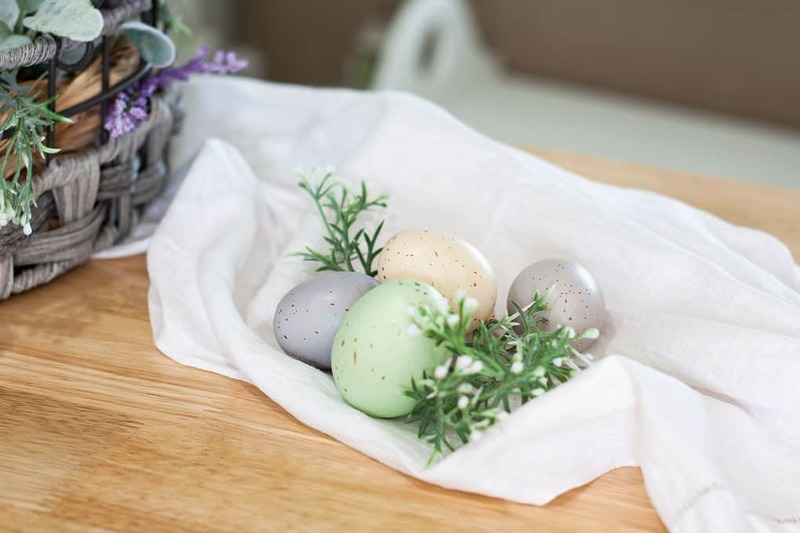 Check out an Easy Way to Make Velvet Easter Eggs here! Adding a linen runner with some candlesticks and aqua candles finishes off the look. I couldn’t be happier! 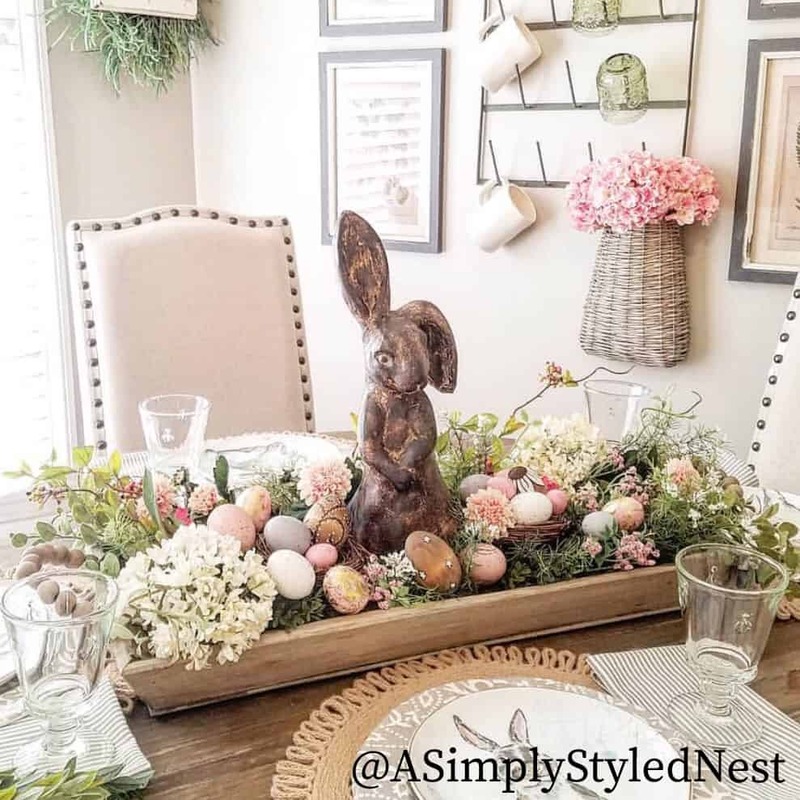 The bunny, florals, and eggs are all inspired by Lisa’s lovely centerpiece! Would you like to learn how to make the velvet Easter eggs? Well, the tutorial should be coming your way VERY soon! The sweet little wooden sign adds just the right finishing touch! And to ‘fill-in’ the centerpiece, you can add a little nest of eggs! Now It’s Time to Do More Hopping! Now you get to see LOTS more inspiration! Next in the “hop” is Emily at Lecultivatuer.com. 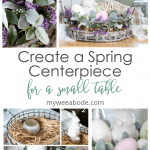 Go check out the twist she has put on this lovely centerpiece challenge. And be sure to visit each of these wonderful blogs for lots more inspiration! Now, you tell me… What would you do to put your twist on this centerpiece! Share in the comments. I LOVE to hear from you! This is so cute. I love the velvet eggs and I can’t wait for a tutorial. Adorable. Julie I love your centerpiece. The touch of lambs ears is perfection. And yes!!! I want to learn how to make velvet eggs!!!! Love me some Lamb’s Ear, Laura. Thanks for stopping in. This blog hop has been a blast with you all! Hugs! Your version is lovely, Julie! 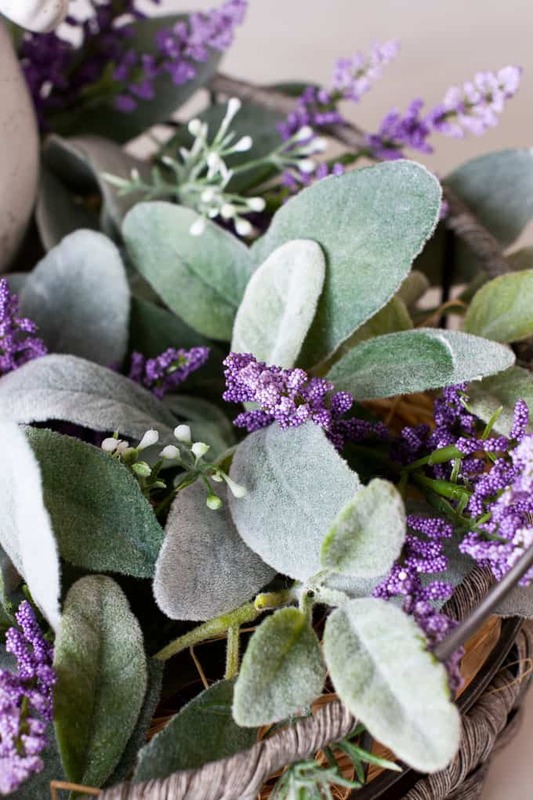 I love how you used Lamb’s Ear along with the other spring florals. Those colors look so good with your velvet eggs. I can’t wait for your tutorial on how to make them. They are so pretty! Aw, thanks, Paula. I’m excited to share about the velvet eggs. This is my first blog hop, and it’s been so fun to be with you all. It’s been a great experience! Hugs and hearts. Julie, I love this! Those velvet eggs are so pretty! I love the pink, green and purple together! Have a great one! Hugs! Sweet arrangement, Julie! I like how you’re bringing back the velvet for spring! 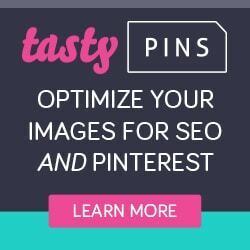 Pinning, my friend! Thank you, Crissy. Yes, I searched for velvet Easter eggs and came up with very little… and no tutorials. So, I think it will be fun to show how to make these, too! 😉 Hugs, sweet friend! Cute, Julie! I couldn’t help but think of the Velveteen Rabbit with your velvet eggs; they’re so pretty! Fun “hopping” with you, neighbor! Hi Julie! Love your interpretation of this Pinterest Challenge!!! 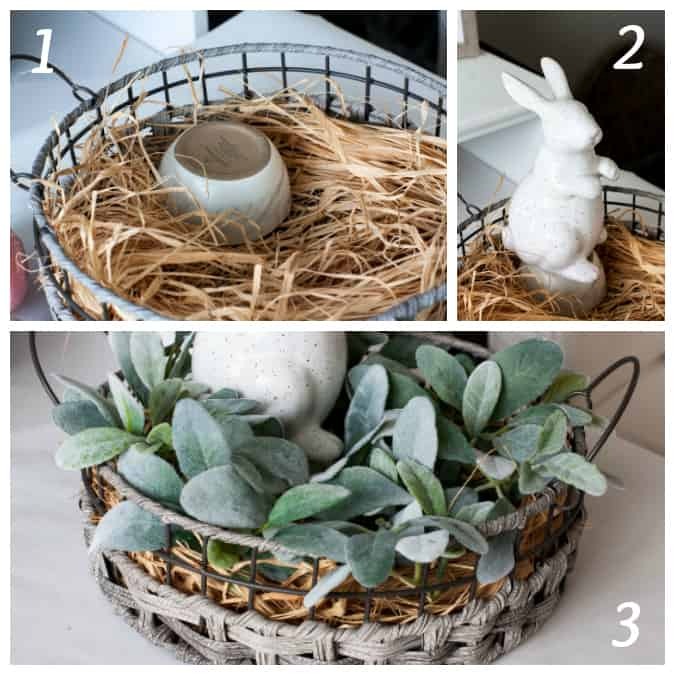 I do love round baskets as they have sooo many uses and are easy to store when not in use. I would like to learn how to make your velvet Easter eggs!!! My velvet pumpkins turned out really well (thank you for your great tutorial!) and I saved most of my stems for a new crop coming up later this year. Thank you, Barbara, for the sweet words! Looking forward to seeing everyone’s later today! Hugs! Julie, what an adorable centerpiece. I am loving your basket for the base of your centerpiece. I love how you showed us how to set your centerpiee up. What a great inspiration. Have a great Easter season. Thank you so much, Terrie! it was really fun and easy to put together. Looking forward to visiting your post, too! Thanks for dropping in, Terrie. I really love that tray, too. I was super happy to find it for such an affordable price. Thanks for the sweet words! This is adorable Julie. I love the velvet eggs also. The centerpiece is the perfect size with just the right amount of interest to not be overpowering. Sweetest centerpiece Julie and I love the pretty velvet eggs.Can’t wait to see how you made those! Hugs! Thank you so much, Michelle. 😉 They are super easy velvet eggs, and looking forward to showing how to make them. Hugs, sweet friend! 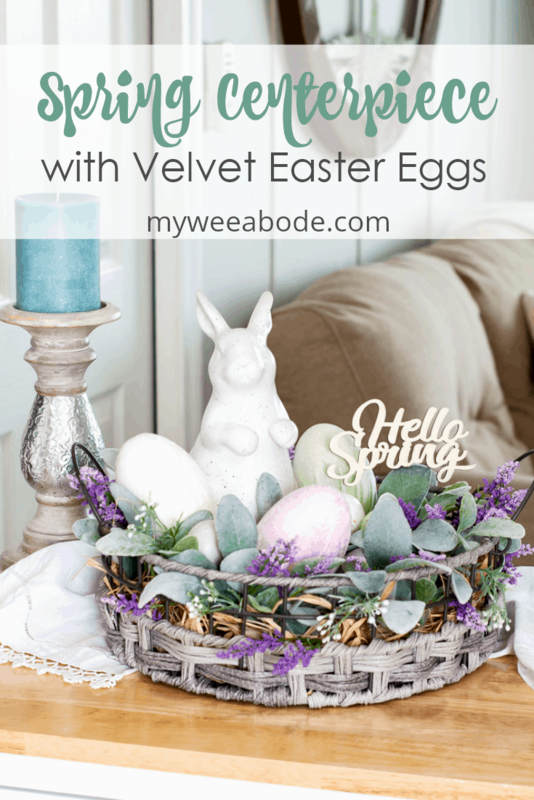 I can hardly wait to see this velvet egg tutorial! They are gorgeous. Love love love your entire “Easter basket”. Thank you so much for joining us. Thank you so much, Cindy! So appreciate you getting this together, and for the sweet comment! Hugs and hearts! Your centerpiece turned out amazing!!! I absolutely LOVE the velvet eggs! So cute!! This is so very pretty! I love those velvet eggs!!! This turned out really cute, Julie. I love the velvet eggs and I’m really curious to see how you made those for sure! Thanks, sweet friend… I’m behind a bit as I’ve been out of town. Trying to play catch-up now! 😉 You are always so sweet! Thanks, Leslea! Had such fun doing this with everyone! 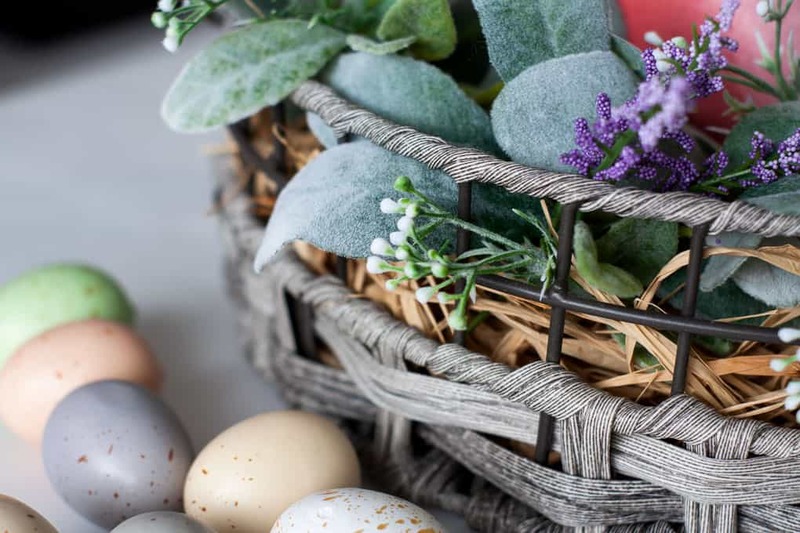 Your velvet Easter eggs are so cute and I love the round basket. Adorable, Julie! I just had a customer come in the other day looking for a Spring centerpiece. This would have been a perfect reference for her to make her own 🙂 And those velvet eggs? Love! You know I adore your centerpiece but I wanted to add … thank you so much for linking up to our Celebrate Your Story link party. We hope we are providing a celebration of your post and perhaps yours will be chosen as a feature by one of the hosts. Aw, thank YOU, Kari! You’re a dear! This is pretty! I like the touch of the wooden sign! This is absolutely adorable, Julie! Pinning! I love this Julie — So soft and sweet! I love how you arranged it all. Your photography is so beautiful! Thanks so much for sharing it at Thursday Favorite Things! 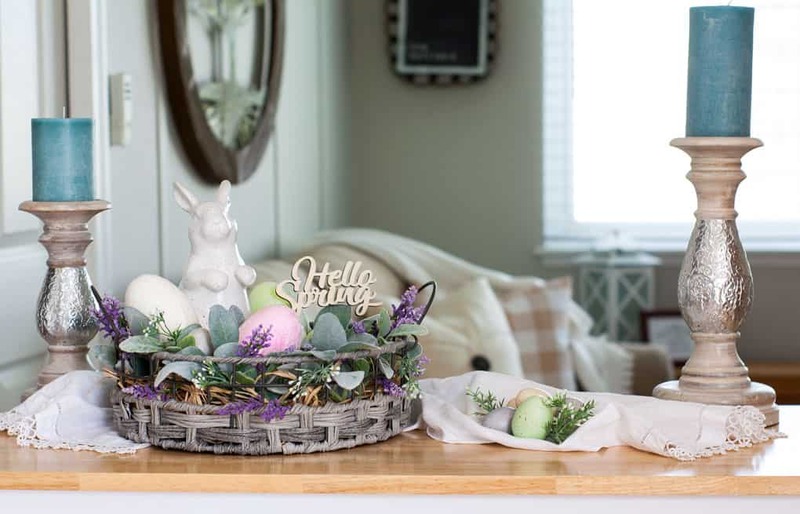 Such a sweet little easter basket for spring great job. Also I love the bunny he is so cute. Thanks, Jen! Yes, when I saw the bunny, he had to go home with me! Feel free to link-up at Homestyle Gathering, we would love to have you! Super super cute Julie! I love the little spring sign and the velvet eggs. I am looking forward to the tutorial! Thank you! Tutorial should be going live Saturday! Hugs! Thanks so much, Kippi! I actually have the tutorial up for creating the velvet Easter eggs, too! 😉 Hope you have grand week! As always, thank you, Marilyn! Julie, Yours turned out just adorable. I Love it! Thanks for sharing at the TFT party! I’m featuring you tomorrow! Congrats my friend! Thank you so much for the feature, Theresa! Always love linking-up with TFT! 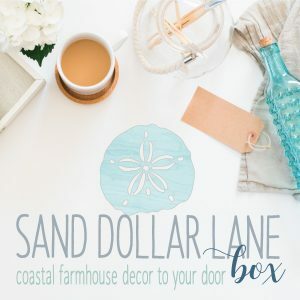 Congrats you are being featured at Thursday Favorite Things! Thank you friend! Hope you can link-up at Homestyle Gathering! Oh, you made my day, Marie! 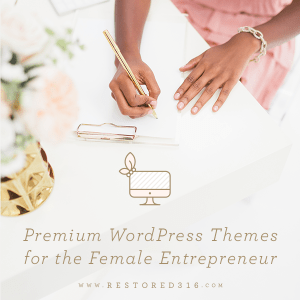 😉 You and I both know that inspiring others is a HUGE part of our blogging! Hugs and hearts, sweet friend! I can’t think of a thing to add to your adorable centerpiece Julie! Well, except a little bowl filled with pastel colored M& M’s 😉 wink wink! It is just adorable!! Ooooo, yes! That’s EXACTLY what it needs! LOL! 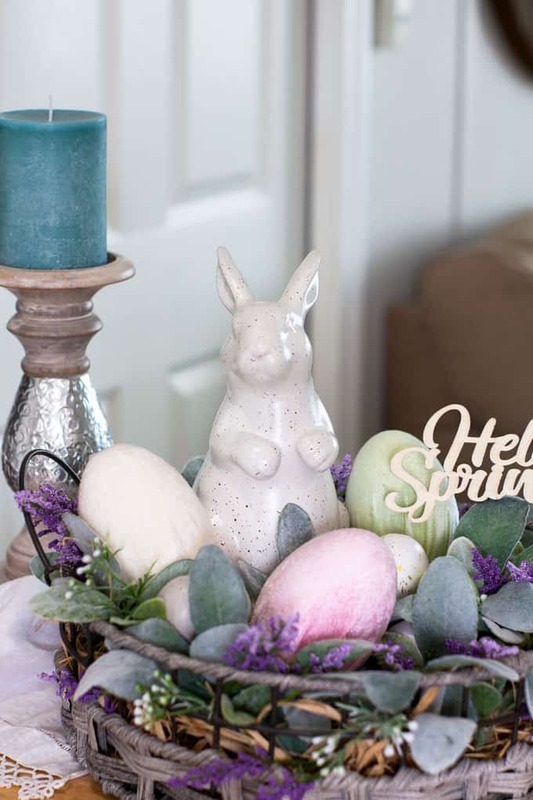 This is such a lovely display for spring and Easter, Julie. Your velvet eggs look gorgeous. Thanks for partying with us at Snickerdoodle. I’ll be featuring this at this week’s party. Hope to see you there! Oh, thank you sweet friend! Always happy to link-up and be featured, too! Hugs! Such a cute Easter display! It is also one of my features at the Snickerdoodle Link Party this week! Thanks, Roseann! So kind of you! Hugs! Julie! This is wonderful!! 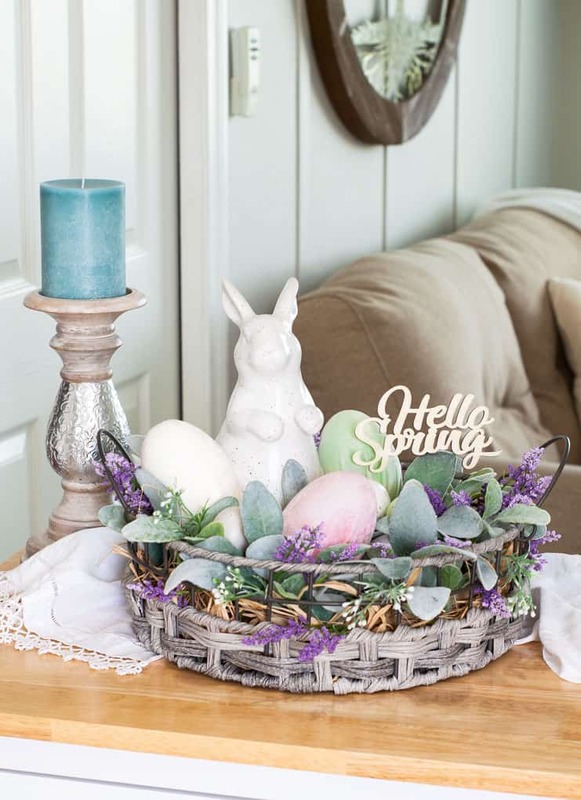 What a beautiful centerpiece you’ve created, and how lovely are those velvet eggs! Thank you so much for joining the Grace at Home party at Imparting Grace. I’m featuring you this week! Julie, love the centerpiece but where did you find the aqua candles? Just what I am looking for! Bonus points if they are unscented! I found you on Grace at Home today. Thanks for hopping on over here, and for the sweet words. Those candles are from Pier 1… it’s one of there stock candles. No bonus points for me, because they ARE scented, and I LOVE the fragrance! Hope this helps, friend!